Because raw fish is discouraged during pregnancy? Are there alternatives to those who like to eat sushi? For those who love Japanese food, pregnancy can be a period of abstinence since most experts advise against the consumption of raw fish during the gestation period. Raw fish, especially fish in the wild sea, may contain harmful parasites to health. In the case of fish such as jaws, swordfish, and saury there is still the risk of high levels of mercury, so their consumption should be avoided even in cooked dishes. Another problem is the possibility of contamination with the listeria bacteria, which causes the listeriosis if the sanitary standards for the preparation and conservation of the fish are not fulfilled. Pregnant women run a greater risk of contracting listeriosis than the rest of the population once their immune system is more fragile. The disease causes unspecific symptoms (fever and widespread malaise) but it can be extremely serious for the developing baby and may cause spontaneous abortion or premature childbirth. Yes, a pregnant woman can eat cooked or vegetarian sushi varieties. 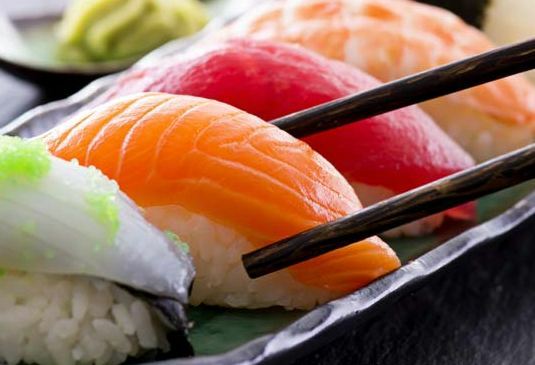 Moreover, according to information from NHS Choices, the official website of the British health system, “a pregnant woman can eat raw fish or little cooked on dishes such as sushi as long as this has been previously frozen” . In this case, the freezing process will kill any pathogens, as would happen if the fish were cooked. This possibility, encouraging for sushi fans, should nevertheless be weighed carefully, because it will be necessary to make sure that the fish has been previously frozen, something that will not be possible at all restaurants. Whether you opt for cooked or prepared sushi with frozen fish, you must avoid fish with a high mercury content, instead preferably salmon or shrimp. Sashimi is sliced raw fish served without rice. Therefore, such as sushi can only be consumed if it has been previously frozen. Can I have sushi at ease? If you decide to eat sushi made with pre-frozen fish, you should do it sparingly and in restaurants with good hygiene conditions. Cooked varieties can be consumed at ease as long as the fish has low mercury. -Cooked sushi from low-mercury fish. -Sushi or sashimi prepared with previously frozen fish and low-mercury. -Sushi prepared with fresh fish. -Fish-based sushi the with high content of mercury, such as shark, swordfish and saury. Next post How to Stimulate the Newborn?